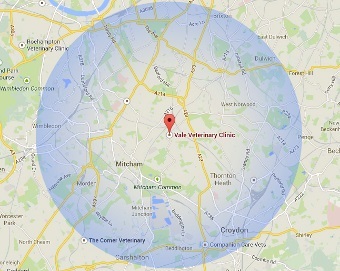 Vale Vets are a professional veterinary practice located in Streatham, dedicated to providing exceptional veterinary services to patients and their owners throughout the South East of England. Focusing on ensuring the happiness and healthiness of each individual animal, we understand the importance of keeping your pets in good health, so that you can enjoy a long and stress free life together. We also provide veterinary assistance further afield where necessary. With a focus on building long lasting relationships with all our patients and their owners, Vale Vets provides a completely personalised service that keeps the best interests of your pets in mind. We take pride in providing an individual service that ensures a long, happy and healthy life for you and your pets. Many of our patients attend the surgery for general health checks and professional advice, as we believe a patient is a friend for life. Vale Vets offer a number of healthcare services dedicated to ensuring the wellbeing of your beloved pet. These services include you initial vaccinations, flea control, hospitalisation care, pet travel and passports, neutering, micro-chipping and more. We also provide a number of professional advice services, including puppy and kitten care, senior care, insurance advice and more. Our pet care plan is perfect for those looking at ensuring their pet’s health throughout the years, as this plan provides a number of free services plus a 10% discount on all other services, including worming control and vaccinations. With over 30 years experience providing helpful advice and assistance on taking care of your pets, our friendly team will be more than happy to give you advice on the best pet care plan for your pets. Should you have any questions regarding the healthcare services we provide to cats and dogs of all sizes, as well as smaller animals such as rabbits, guinea pigs and hamsters, please do not hesitate to get in touch with us today. Simply fill out the form on this page using your contact details and your queries and we will get back to you as soon as possible. Alternatively if you would like to speak to a member of our team directly, just call us on 0208 679 6969 and we will happily answer any questions you might have. We look forward to hearing from you soon.